We are Safer®, Concern®, and Victor Poison-Free® - three strong brands recognized as world leaders in the organic insect control, organic plant disease control and organic gardening categories! We offer the broadest and deepest selection of quality insect control and plant disease control products at competitive prices. Our organic products are targeted to meet the varying needs of you, the consumer! So, whether you are an experienced gardener or novice, there is a product to fit each and every situation. Safer® Brand carries the natural gardening products you need for your organic garden, lawn and houseplants. Our insecticides and herbicides are made with all natural ingredients that have been scientifically proven to effectively kill pests. Whatever your organic gardening needs are, Safer® Brand can help. Kills soft bodied insects such as aphids, mites, and more on contact. Makes up to 6 gallons of solution. Covers up to 1,600 sq. ft. (16oz. bottle). WOW, that is a HUGE value. 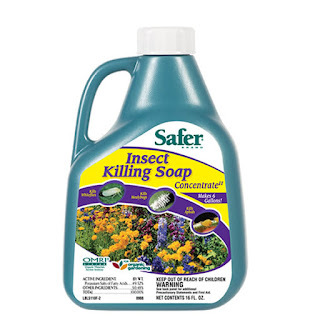 Unlike traditional synthetic chemicals, Safer® Brand Insect Killing Soap breaks down into its natural elements within 7-10 days, leaving no residual impact on the environment. Safer Brand Insect Killing Soap Concentrate is the perfect product to use to eliminate soft bodied insects. I've always wanted to grow a garden and last year I finally did it only to have everything completely eaten up by bugs. It was so sad. I had put hours and hours into taking care of my garden and as soon as it started to produce some fruit and vegetable the bugs got to work and what seemed like overnight, my garden was destroyed. I vowed this year I would try again and with Safer Brand Insect Killing Soap Concentrate I've been able to do just that. I was finally able to taste the fruits of my labor and had some wonderful tomatoes and bell peppers. I love that Safer Brand Insect Killing Soap Concentrate contains no chemicals making it safe for humans as well as the environment. This product is a must for anyone looking to have a thriving garden! Kills a variety of crawling insects including bed bugs and roaches. Each bag contains 4 pounds of food grade sourced Diatomaceous Earth. Made from FOOD GRADE Diatomaceous Earth! Leave bugs dead in the dust. That’s exactly what you’ll see with Safer® Brand’s Ant and Crawling Insect Killer. And you don’t have to worry about applying chemicals to get the job done. Kills any type of crawling insect within 48 hours. Once you apply Ant and Crawling Insect Killer where you have a crawling insect problem, you’ll see insect activity stop in minutes. Infestation issues in a couple of days. Dual action. Kills insects by ingestion and dehydration. You can use it inside your home or outside in gardens, or on patios and walkways. It lasts as long as it’s dry. 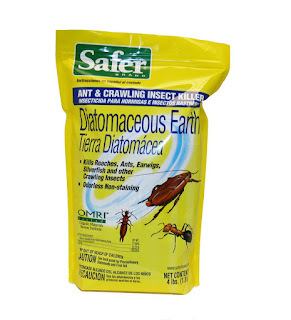 Details on how Diatomaceous Earth works to kill crawling insects. Diatomaceous Earth (DE) is a dust-like product that contains the crushed fossilized algae (diatoms) from fresh water. These crushed diatoms feel like powder when we rub it in our hand. But it’s very sharp to insects with delicate exoskeletons. When you apply DE, dust is ingested by the crawling insect or the insect crosses through the powder. The DE will cut their exoskeleton. This causes the insect to dehydrate and die. Insects cannot develop a resistance to it since there are no chemicals to which they can build up immunity. At Safer® Brand, we pride ourselves in offering you organic products. Ant and Crawling Insect Killer is another product you can feel confident using in and around your home. OMRI Listed® and USDA Approved for Organic Gardening. No worries of toxic residuals. What type of Diatomaceous Earth is this? Beware. Not all DE is the same. Our DE is made of Silicon Dioxide. This comes from a freshwater source. It is the same type as used in food-grade diatomaceous earth. Be careful of products made of Diatomite DE. It is made from unnatural sources. Use DE to solve problems with virtually any crawling insect. Ants. Earwigs. Cockroaches. Silverfish. Crickets. Fleas. Centipedes and more. Safer Brand Diatomaceous Earth is an amazing product! I live in Arizona and we have scorpions so bad this year, so I'm doing everything possible to eliminate them. I don't know whether Diatomaceous Earth will kill scorpions but I do know it will kill their food source. We have had a huge infestation of crickets this year in our backyard and within a week of laying Diatomaceous Earth the crickets were gone. We also haven't seen a scorpion all month so I'm really hoping they've packed up their bags and moved. I was also finding earwigs in our kitchen, so I sprinkled Diatomaceous Earth around the baseboards and now when I find an earwig it's no longer living. I hate bugs but I hate pesticides more so I'm happy to have found a pesticide free way to eliminate the pests both inside and out of my home. Safer® Brand Fast Acting Weed & Grass Killer RTU 32oz. Extremely fast acting natural weed killer. Features easy to use spray bottle. Will not move through soil or damage nearby plants. Soil can be reseeded 2 days after application. Herbicidal action is visible within hours. Were you aware that synthetic chemicals can travel through the soil and damage nearby plants? Do you want to kill weeds in your garden and home, but do not want to use synthetic chemicals? Safer® Brand has the answer! Natural weed killer such as Safer® Brand Weed and Grass Killer will not travel throughout the soil and damage nearby plants. Synthetic chemicals can also leave residuals that stay in your soil for upwards of a year, possibly allowing your pets and children to become exposed to these residuals. 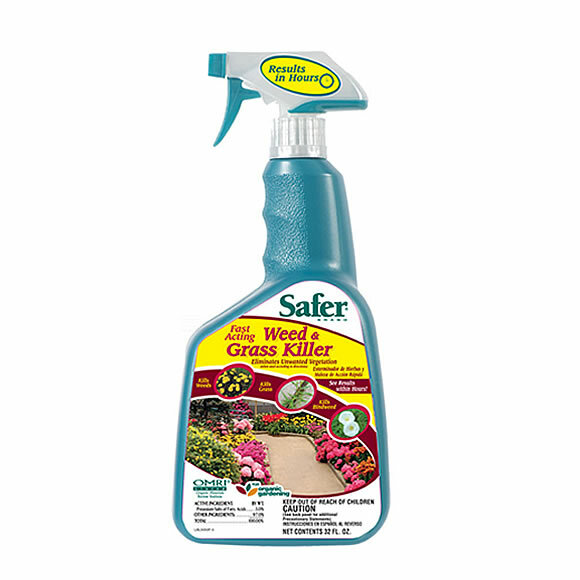 The Safer® Brand Fast Acting Weed and Grass Killer utilizes potassium salts of fatty acids which kills weeds and unwanted grasses in and around walks, fences, patios, driveways, flowerbeds, vegetable gardens, trees and shrubs. The herbicidal action is rapid with effects visible in hours. This effective weed killer will not move through soil or injure nearby plants, as well as break down into its natural state in as little as 5-7 days, unlike synthetic weed killers. Eliminate unwanted grass and weeds with this powerful formula. Weeds can crowd out your flowers and starve them of vital nutrients. Using this product will allow your plants room to breath and allow them to receive nutrients from the soil. Using a product such as Ringer® Lawn Restore fertilizer feeds your soil so that your soil can provide your plants with the healthy nutrients they need. With a full line of organic lawn fertilizer products, and organic weed control, Safer® Brand provides you with the tools for an organic lawn. Safer Brand Fast Acting Weed & Grass Killer is another wonderful product for my garden and for keeping the HOA notices at bay. My front yard is a desert landscape but every few days the weeds start popping up and if I don't get them pulled within a week the home owners association sends me a notice. I love that I can spray the weeds with Safer Brand Fast Acting Weed & Grass Killer and within days the weeds are dead. I also love that this works in my garden to kill those pesky weeds and occasional grass over growths. This is another wonderful product by Safer Brand and I highly recommend it! Follow Safer Brand on social media! Thanks for your reviews on these products...I'll have to check them out! Definitely need to check this out. I am very happy to find safe products. I would LOVE to try this! I have been looking for something more like this! Thanks for the review..I do not have a garden, but if I did, these would come in handy. Thank you for the review! I have been looking for high quality safe products for my lawn. Thanks for the review. We have ant problems some years.